Character and ability are inherited. That was Francis Galton's conviction, one that served him well, given his own impressive pedigree. When reading Charles Darwin's On the Origin of Species , Galton claimed that he "devoured its contents and assimilated them as fast as they were devoured, a fact which may be ascribed to an hereditary bent of mind that both its illustrious author and myself have inherited from our common grandfather, Dr. Erasmus Darwin." In fact, Charles and Erasmus Darwin both might have found some of Galton's convictions a little embarrassing. A man of means, Galton attended Trinity College, Cambridge, where he partied like a Victorian frat boy, and followed up the parties with a nervous breakdown. After securing a degree, he began traveling. After wandering about without much purpose for several years, he sharpened his ambition and began an expedition to Africa, assimilating a wealth of knowledge about the landscape. Yet his opinions of some of its inhabitants were less than charitable. Once, while I watched a [member of the Damara tribe in Southern Africa] floundering hopelessly in a calculation on one side of me, I observed Dinah, my spaniel, equally embarrassed on the other. She was overlooking half a dozen of her new-born puppies, which had been removed two or three times from her, and her anxiety was excessive. . . . She evidently had a vague notion of counting, but the figure was too large for her brain. Taking the two as they stood, dog and Damara, the comparison reflected no great honour on the man. To be fair, when Galton later heard of a violent dispute between European travelers and a neighboring African tribe, he sympathized with the Africans, thinking the Europeans should have remembered they were guests in someone else's country. Among Galton's many contributions to science were discovering the anticyclone and pioneering the use of fingerprinting. Galton initially hypothesized that fingerprints could provide useful information about genealogy, race, even social class. The evidence he gathered proved that hypothesis wrong. To his credit, he admitted as much. A maniac for classification, he developed a "Beauty-map" of the British Isles, based on how many pretty women he encountered, recording their beauty by discretely arranging pins in his pocket. He gave London the highest score and Aberdeen the lowest. (Taking his interest in beauty all the way to Africa, he once encountered a "Hottentot" woman with pronounced steatopygia (a large behind). Knowing that look to be the height of fashion in Europe at the time, he whipped out his sextant and took thorough measurements of her figure from a distance.) Galton also identified regression to the mean: Parents of above-average height usually have children who are shorter than themselves, he explained, while shorter parents have taller kids. In other words, the tendency in a large population is to move to the mean characteristic. Galton accepted evolution, but this finding made it difficult to understand how it could proceed by small steps, as Darwin proposed. 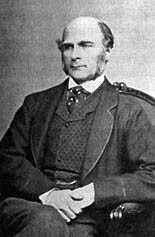 Galton concluded that evolution occurs more by jumps, though others, such as Alfred Russel Wallace, argued that environmental pressures would force new population characteristics. Determined to measure intelligence in human subjects, Galton established an Anthropometric Laboratory at the International Health Exhibition in London in 1884. He didn't measure intelligence with anything like a written IQ test. 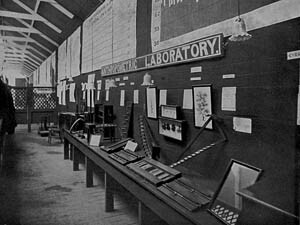 Instead, some 9,000 visitors to this laboratory paid three pennies apiece to undergo 17 body measurements (including height, skull size, hand strength and the power of one's punch) and walk out with score cards telling them how smart and fit (or not) they were. Galton found his visitors to be a handful, a situation not helped by the availability of alcohol at the exhibition. In the 1890s, he turned his attention to more pliable subjects: dogs. At the 1899 Crystal Palace Dog Show, he adopted what he called a standard method for photographing his canine subjects, placing them on a standard platform against a uniform backdrop with the camera always set at the same distance from the platform and the ground. By observing animals with short lifespans, he was able to gather evidence on more than two generations, which had been a limiting factor when studying people. Even better, the dogs didn't drink. As far as Galton was concerned, physical characteristics could reveal more than intelligence; they could show one's criminal tendencies, too. He took photos (and sometimes photos of photos), using the same photographic plate for all the criminals. This technique rubbed out the individual characteristics leaving a kind of facial archetype of the worst sort of person. Among the misfits he found two types: one with features "broad and massive, like those of Henry VIII, but with a much smaller brain," and the other "weak and certainly not a common English face." Galton's photo studies also allegedly distinguished between archetypes of British military officers and pedestrian privates. Galton is best remembered as the father of eugenics. Now that natural selection was understood, he felt it should be applied to humans. He fretted that the "unfit" were no longer weeded out by natural selection, but instead survived and bred like bunnies in big-city slums. He criticized "pretensions of natural equality," insisting that ability was inherited. For examples of the finest human specimens, Galton felt the need to look no further than his own family tree. The diagram on this page shows what he once published in Nature , identifying family members who possessed scientific ability or brilliance, along with regular mortals. 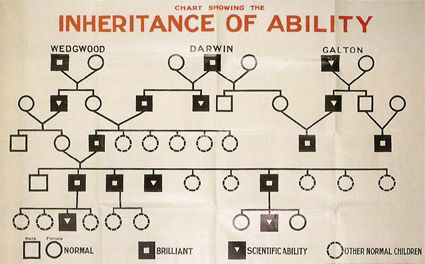 (Galton's analysis of his family tree didn't consider the possibility that he and his relatives might have enjoyed similar advantages such as wealth, connections, or access to the best schools.) Two of the super-bright ancestors in this diagram were the potter Josiah Wedgwood and the polymath Erasmus Darwin. Not surprisingly, their mutual grandson Charles got a brilliant box. Sharing one grandfather with his famous cousin, Galton apparently felt justified in giving himself a brilliant box, too. Given his insistence that ability is determined by inheritance, however, he made a curious exception to that rule in giving another brilliant box to a different cousin, who, from the looks of this diagram, inherited nothing more than scientific ability from Grandpa Galton. Perhaps family loyalty influenced Galton's judgment. Or perhaps he was ahead of his time in grasping the concept of advantageous mutation — in this case mere ability transmogrifying into sheer brilliance. Galton's manifesto was Hereditary Genius . In the chapter entitled "The Comparative Worth of Different Races," he explained that the Greeks lost their racial superiority when they began breeding with more pedestrian peoples. By remarkable coincidence, Galton concluded that, by his time, the world's best brains occurred inside white male bodies in Britain. Shortly before his death, he wrote a story, Kantsaywhere , describing his eugenic utopia, complete with buxom women, apparently a crucial ingredient of his utopia. Bright, healthy individuals (such as members of the English aristocracy and gentry) were treated and paid well, and encouraged to have plenty of children. Social undesirables were treated with reasonable kindness so long as they worked hard and stayed celibate. Although Galton's vision was chilling, he likely would have been sickened by the forced sterilizations and mass exterminations later carried out in the name of improving society. Galton was rumored to have an IQ of almost 200, but had he been born a generation or two later, he might have found himself an arguable target for sterilization, given his propensity for nervous breakdowns. As it was, he regretted the fact that he and his wife never had any children of their own, a situation he quietly suspected might have resulted from his fondness for sewing wild oats in his younger days.